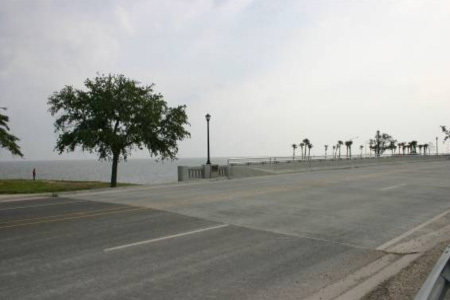 This project includes a new bridge along Lakeshore Drive over the Orleans Avenue Canal, subsurface drainage, seawall repair, roadway lighting, tree transplanting (18” ø to 42 inch diagram oak trees) and utility relocations. DEI was responsible for the design and preparation of drawings and specifications for a four-span solid slab 170’ bridge replacing the exiting bridge with steel girders. 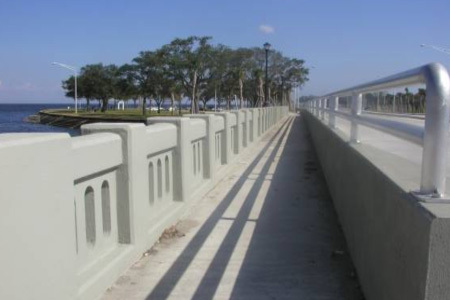 This project involved replacement of the existing bridge to permit its inclusion into the Orleans Parish high-level hurricane and flood protection system. The bridge has continuous concrete girders supporting a concrete deck. The bridge is supported by pile bents. 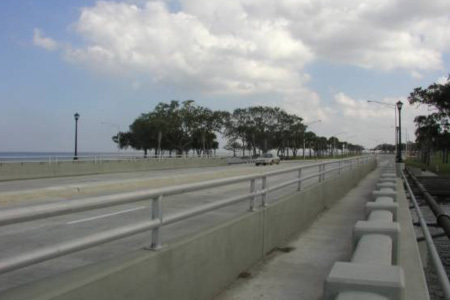 The bridge is a flood-proof structure with high barrier wall/headwalls along each side of the roadway. Bridge was designed for uplift and the bents are checked for very high lateral loads using Hrennekoff Analysis Corps of Engineers pile design computer program. The bents are analyzed for twelve load combinations involving high water buoyancy loads and HS 20 truck loading per both AASHTO specifications and Corps of Engineers requirements. Pile bents were used to resist both uplift and lateral loads. A concrete deck bridge supported by prestressed concrete pile bents.